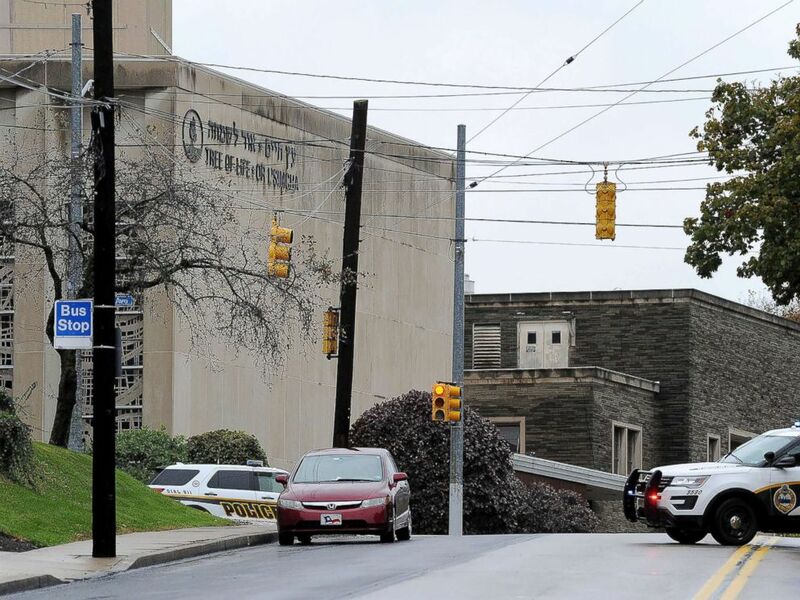 Eleven people were killed and at least six more were injured -- including four police officers -- when a gunman opened fire at a Pittsburgh synagogue Saturday morning, authorities said. Interested in Pittsburgh Synagogue Shooting? Add Pittsburgh Synagogue Shooting as an interest to stay up to date on the latest Pittsburgh Synagogue Shooting news, video, and analysis from ABC News. "It's a very horrific crime scene," Alleghany Public Safety Director Wendell Hissrich told reporters during the press conference Saturday afternoon. "It's one of the worst that I've seen." Police responded earlier Saturday to reports of active gunfire at the Tree of Life Or L’Simcha congregation, where a service was taking place, Hissrich said. The suspect is in custody and has been taken to the hospital, Hissrich said. Eight men and three women were killed in the shooting, according to a criminal complaint. One of the four officers is in critical condition. 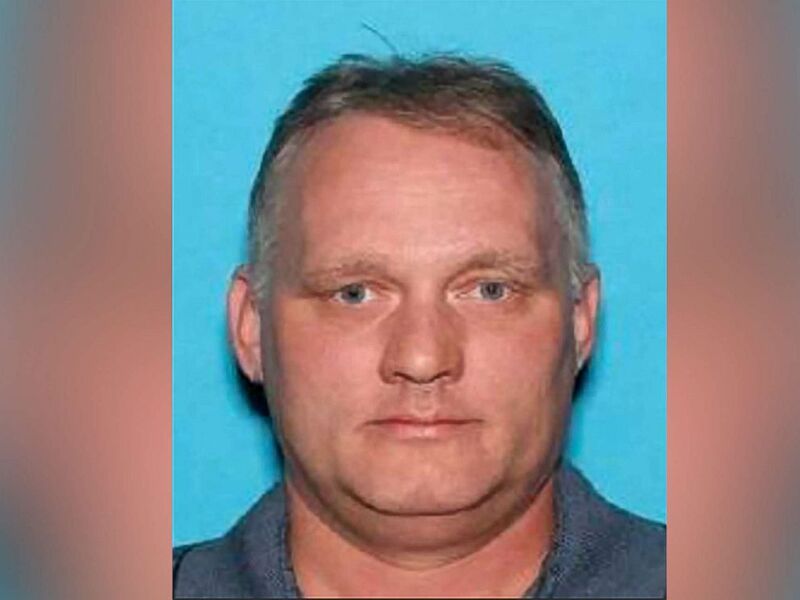 The shooter has been identified as Robert Bowers, who is 46 years old and lives in Pittsburgh. Bowers use at least one assault rifle in the shooting and had three handguns on him. Bowers was charged with 29 federal counts late Saturday, including several hate crimes. He is facing 11 counts of obstruction of exercise of religious beliefs resulting in death, 11 counts of use of a firearm to commit murder, four counts of obstruction of exercise of religious belief resulting in bodily injury to a public safety officer and three counts of use and discharge of a firearm during and in relation to a crime of violence. The four counts of bodily injury to a public safety officer stem from the police officers injured in the shooting. Bowers was not known to the FBI before Saturday, Bob Jones, the agency's special agent in charge, said during a press conference Saturday afternoon. He is believed to have acted alone, Jones added. A Department of Motor Vehicles ID picture of Robert Bowers, the suspect of the attack at the Tree of Life synagogue in Pittsburgh. He suffered multiple gunshot wounds and was in fair condition at a local hospital, Hissrich said. In addition to the federal charges, Bowers was also charged with 35 state offenses, including 11 counts of criminal homicide, six counts of criminal attempted homicide, six counts of aggravated assault and 13 counts of ethnic intimidation. People gather on a corner near the Tree of Life Synagogue in Pittsburgh where a shooter opened fire, Oct. 27, 2018. The congregants were attending a baby-naming ceremony in the synagogue, Pennsylvania's state attorney general told the Associated Press. There were no children among the dead, Hissrich said. Jennifer Paddy said her daughter, who was staying at a friend's house near the synagogue, "heard rapid gunfire." "Her and her friend ... they ran downstairs and barricaded themselves in the basement," she told ABC affiliate WTAE in Pittsburgh. Since the incident happened at a synagogue, it is being treated as a federal hate crime and will be handled by the Federal Bureau of Investigation (FBI) with the assistance of local, county and state police, he added. 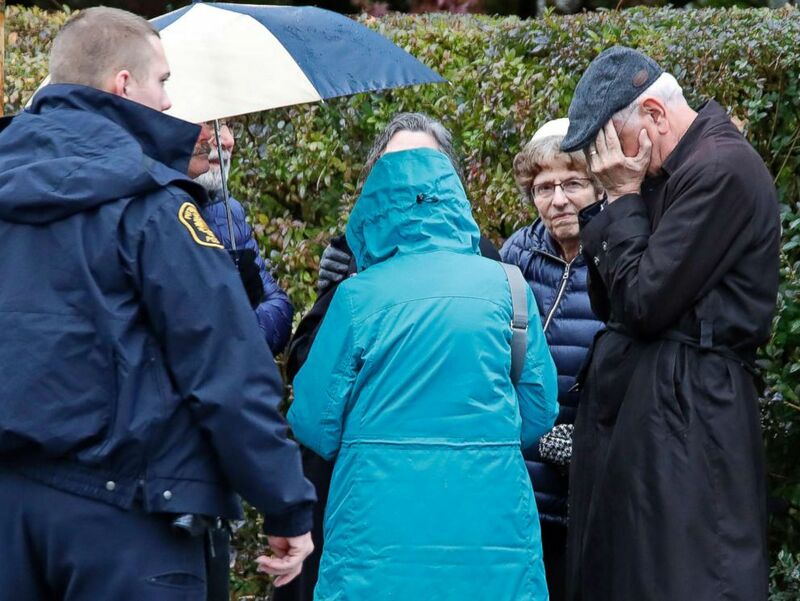 First responders surround the Tree of Life Synagogue in Pittsburgh where a shooter opened fire, Oct. 27, 2018. The Anti-Defamation League said it was "unconscionable for Jews to be targeted during worship on a Sabbath morning." "This is the deadliest attack on the Jewish community in the history of the United States," it said in a statement. First responders prevented the shooting from becoming a worse tragedy, and the injured have been taken to three area hospitals with level one trauma centers, Hissrich said. "Without their courage, this tragedy would have been far worse," said Hissrich said. Rabbi Alvin Berkun, who was not at the synagogue at the time, told ABC News he was "stunned" and "sorry" to hear of the shooting. He said he had stayed home from services Saturday morning because his wife was sick and that he has not heard from friends who were in the building. 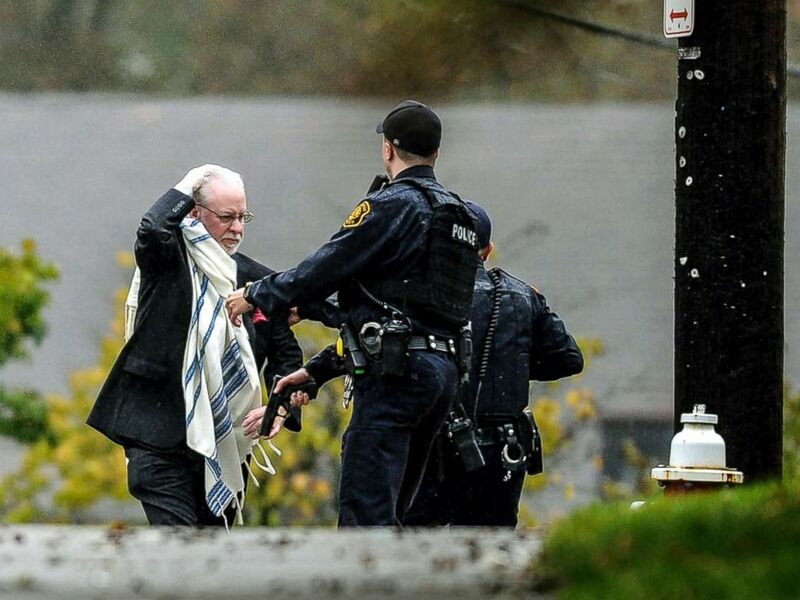 A man is escorted out of the Tree of Life Congregation by police following a shooting at the Pittsburg synagogue, Oct. 27, 2018. Berkun, who lives nearby the synagogue, said police officers came to his door and told him to stay inside his home. 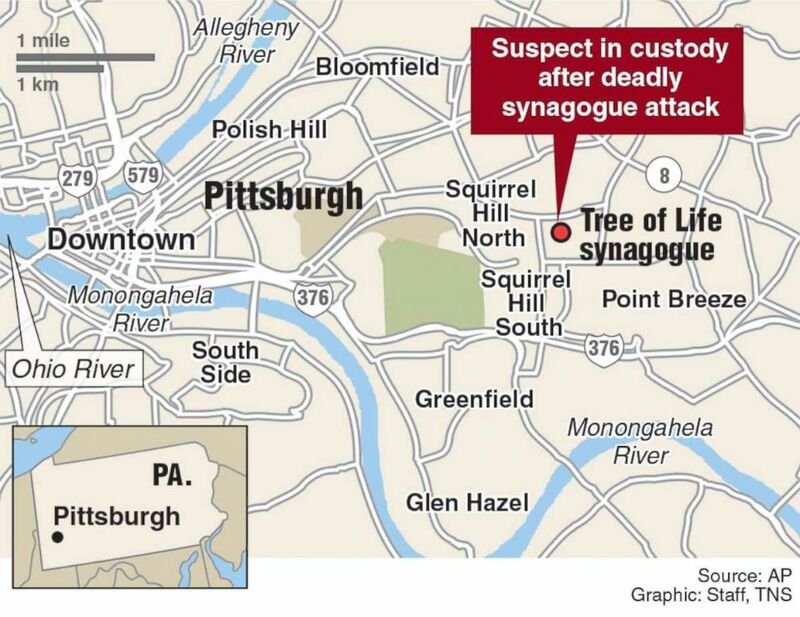 He described the neighborhood of Squirrel Hill, where the synagogue is located, as "a very Jewish neighborhood" which is "known as a Jewish community." "There's absolutely no crime, it's an amazing neighborhood," Berkun said. "It's hard to believe it's a city neighborhood. It's dominated by the Jewish community center four blocks away ... by kosher bakeries -- all kinds of Jewish gift shops, bookshops, a number of synagogues." "There is one major synagogue but there are at least five other synagogues within two miles of where we are," he said. 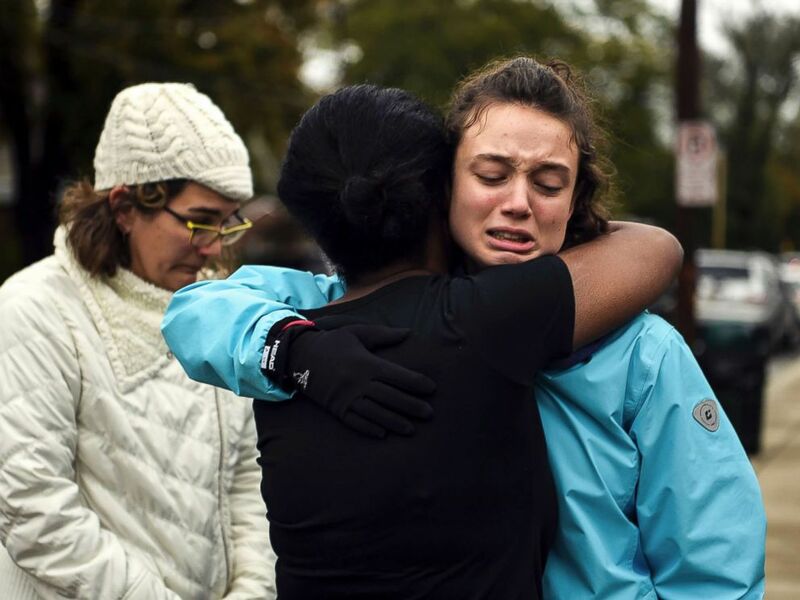 From left, Kate Rothstein looks on as Tammy Hepps hugs Simone Rothstein, after multiple people were shot at The Tree of Life Congregation synagogue, Oct, 27, 2018, in Pittsburgh. 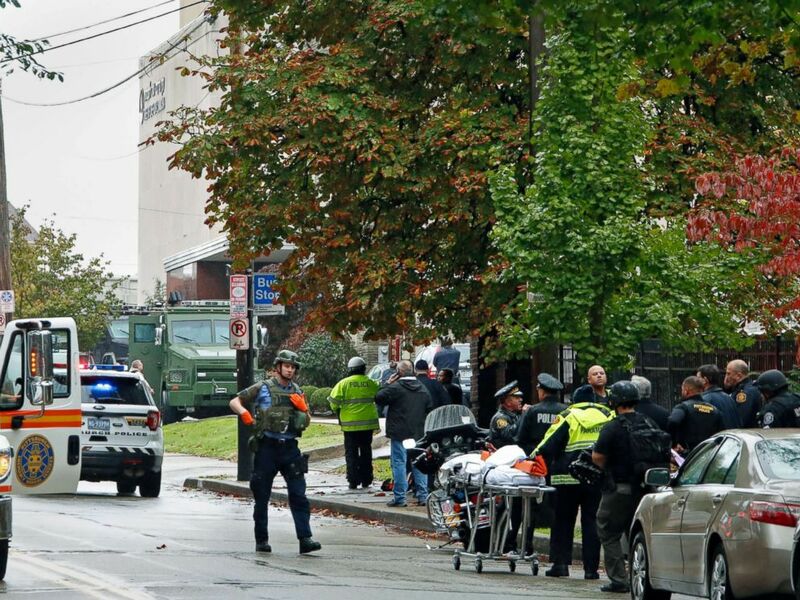 When the gunman opened fire at the synagogue, law enforcement officers, including agents from the FBI and the Bureau of Alcohol, Tobacco and Firearms (ATF) swiftly responded to the scene. The suspect was apprehended a short time later. The synagogue is a conservative Jewish congregation, according to its website, and there was a morning Shabbat service scheduled from 9:45 a.m. to noon. Locator map of deadly shooting in Pittsburgh synagogue. Berkun said there are "three different religious groups that are meeting in our building on Saturday morning with three distinct services," estimating that there could have been approximately 75 people in the building at the time. Hissrich declined during the press conference to say how many people were inside at the time. 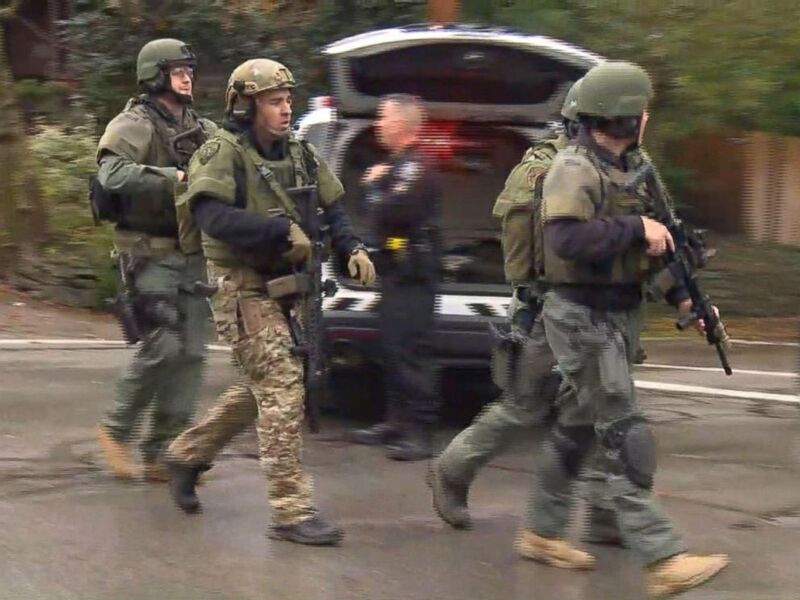 Police respond to an active shooter situation at the Tree of Life synagogue in Pittsburgh, Oct. 27, 2018. By late Saturday afternoon, with the death toll at 11, President Donald Trump signaled that he will change the tone of his typical rally speeches, telling reporters that "tone is very important." He said he was enthusiastic about being on the campaign trail, but that Saturday's mass shooting had changed things. "Tonight, I will absolutely change my tone," he said. Earlier, speaking to reporters before boarding a flight to the event in Indiana, Trump called the attack "a shame," calling the suspect "a wacko" and a "maniac." He also said the suspect should "pay the ultimate price" and be subjected to the death penalty. When asked about whether the nation's gun laws should be changed, Trump said the synagogue should have had armed security there. "You want protection, and they didn’t have any protection, they had a maniac walk in," Trump said. "The results could have been much better." He said that before getting into office, he would think "what a shame, what a shame" when incidents like this one unfolded. "It’s even tougher when you’re the president of the United States and you have to watch this thing happen," Trump said. After he arrived Saturday afternoon, the president said the shooter appeared to be an "anti-Semitic crime." "That is something you wouldn't believe could still be going on," he added. After hinting earlier in the day that he might cancel Saturday night's rally out of respect for the dead and wounded in Pittsburgh, he told the crowd that he was inspired to attend the rally by the late New York Yankees' owner and friend George Steinbrenner -- and his resolve for the Yankees to play after the September 11th attacks in 2001. Trump also claimed that the US Stock Exchange remained open, though it was closed for six days after the attacks. Vice President Mike Pence offered his condolences on Twitter. "Praying for the fallen, the injured, all the families impacted, and our courageous first responders,” he tweeted Saturday morning. "God bless them all." Monitoring reports of shooting at Tree of Life Synagogue in Pittsburgh. Praying for the fallen, the injured, all the families impacted, and our courageous first responders. God bless them all. First lady Melania Trump said her "heart breaks" over the shooting, and that "the violence needs to stop." My heart breaks over the news out of #Pittsburgh. The violence needs to stop. May God bless, guide & unite the United States of America. Pennsylvania Gov. Tom Wolf tweeted that he was headed to Pittsburgh. Police at the scene in Pittsburgh where an active shooter was reported, Oct. 27, 2018. "We are providing local first responders with whatever help they need," he wrote. On my way to Pittsburgh. Headed to the scene at Tree of Life Synagogue shooting. We are providing local first responders with whatever help they need. By Saturday evening, residents of the Pittsburgh apartment building where Bowers lived who had been evacuated were allowed back into their apartments. One neighbor described the suspect to ABC News as a quiet loner who lived alone and didn't stick out as any sort of danger. The New York City Police Department and the Los Angeles Police Department said that they are deploying extra teams to synagogues and Jewish locations throughout those cities as well. "The NYPD is deploying heavy weapons teams, including the officers from the Critical Response Command and the Strategic Response Team, to houses of worship across the City," the department said in a statement. "Additionally, sector cars in every command across New York City will be making additional visits to ensure the safety of all of our residents. Currently, there is no nexus to New York. But these steps are being taken until further information is learned about the events in Pittsburgh by the NYPD." Police in Washington, D.C., are also on alert. "We have reached out to Jewish community leaders and have directed officers to pay special attention to synagogues until further notice," a spokesperson for the D.C. police department said.